AMC Nursery and Landscaping offers a variety of mulch and topsoil in pa, We also carry decorative rock for all your landscaping needs. All of our mulch items are available for pickup or delivery. Delivery is an additional charge and varies upon your Montgomery County or Bucks County location. Please call our office for more information and pricing on our mulch and topsoil products. Same day delivery is also available! If your wondering how much topsoil will I need? use this formula - 1 cubic yard will cover an area 10x10 ft/3 inches deep - Or use our handy topsoil calculator to figure out your topsoil needs. ORGANIC COMPOST BLEND -- This product is a combination of mulch and compost. It is excellent for use in flowerbeds and vegetable gardens. COARSE TOPSOIL - This soil is not screened and is primarily used for filling in large areas. 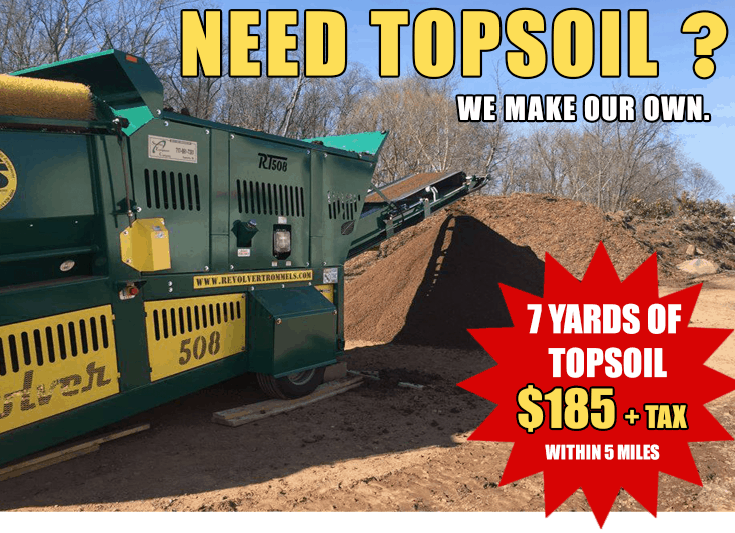 SCREENED TOPSOIL - Our topsoil is screened to remove large rocks and sod. This type of soil is excellent for use in new beds and for lawn repair. If your wondering how much mulch will I need? use this formula - 1 cubic yard will cover an area 10x10 ft/3 inches deep - Or use our handy mulch calculator to figure out your mulch needs. BLACK DYED HARDWOOD MULCH - This mulch is also a double ground hardwood, dyed with a non-toxic colorant to help prevent fading. TRIPLE GROUND HARDWOOD MULCH - This our most popular mulch. It is dark brown (not dyed) and can be used in all types of landscaping applications. DOUBLE GROUND HARDWOOD MULCH - It is dark brown (not dyed) and can be used in all types of landscaping applications. All landscape stone is available by the ton and is available for pickup or delivery. Please contact us for pricing and delivery information. 2B CLEAN STONE - 3/4"
2A MODIFIED STONE - 3/4"
At AMC Nursery and Landscaping of Souderton, PA we offer the best mulch & topsoil at an affordable price for all your landscaping and garden needs. All mulch & topsoil is available for pickup or delivery. Delivery is an additional charge and varies upon your Montgomery County or Bucks County location. Please call our office for more information on our mulch & topsoil products. Same day delivery is also available! AMC Nursery & Landscaping, Inc.